When I was recently exploring the use of woods in feminine fragrances, I realized that half of the perfumes I wanted to mention in an article were either discontinued or reformulated to the point of no longer suiting my theme. Therefore, I unpacked my older bottles and started comparing and taking notes. Since Guerlain is one of the houses with a particularly impressive collection of classics, I was curious to see what difference exists between the old and the new versions. Below are my observations. With some exceptions, which I will note, I have only compared the extrait de parfum concentrations. I relied on testers at Bergdorf Goodman, which were full and fresh. While Guerlain fragrances have been reformulated on numerous occasions during the course of their lifespan, I looked only at the fragrances sold now. The age of own bottles ranged from 1950 (Shalimar) to 1990 (Samsara). So, I am sharing my notes with you, in case they might be helpful. Out of all Guerlain reformulations, Shalimar appealed to me the most. It has the character of the original, with the dark, rich, oriental accord still intact. Of course, it is missing the radiance of ambergris and some natural animalic notes in the original, but frankly, if it is a choice between a nice perfume and ecology, I will take the latter. The genius of the effervescent bergamot juxtaposed with the dark, rich vanilla still amazes me, despite this idea being used extensively in many fragrances created since 1924. Added 1/22/11: I compared the parfum concentration and the available Eau de Parfum. The leathery-castoreum notes are not as pronounced in the EdP, but the essential Shalimar structure is in place. For the richness and complexity, I prefer the parfum. Given the astronomical price and the lack of availability of Indian sandalwood, I fully expected that Samsara would be a complete disappointment. Yet, I was wrong on that count. Samsara is marvelous—radiant, opulent, with an amazingly strong sillage. Its seductive, voluptuous character is still intact. In the Samsara parfum I smell very nice natural citrus oils and its warm rose-sandalwood core is inviting and smooth. The drydown is a bit flat, heavy on vanilla and almond scented coumarin, rather than woods. By contrast, the drydowns of the Eau de toilette and the Eau de parfum are more animalic and darker. The EDP has a crisp peppery note that fits well with the rose-sandalwood theme. Compared to the other concentrations, it is muskier and warmer. The story goes that the original Samsara included 40% natural sandalwood, but I do not know how long it has been since this was true. Even in the mid 1990s the woody accord of Samsara has already differed from the original launch. Moreover, since the synthetic sandalwood is also responsible for the woody character of Samsara, I would imagine that new sandalwood materials are being used to amplify the accord now. At any rate, it is well-balanced, and the screech of sandalwood synthetics that I noticed in Samsara a few years ago is not evident. The parfum smells thinner and more attenuated compared to the original version, with a stronger vanilla note coming through in the drydown. That being said, it is still a great composition and its green floral character set against a modern oriental accord is beautiful. Nice sillage. Added 1/22/11: Chamade Eau de Toilette is excellent, with a nice tenacity. Compared to the older (1990s) versions of the EDT, the new one is good, green, vibrant, exhibiting the beautiful contrast between cool and warm notes. It is thinner, but overall, it is a good reformulation. Added 11/23/13: The new batch of Chamade has gotten its curves back, and all versions are excellent. The Eau de Toilette is graced with a sparkling green top note that feels richer, brighter and more faceted. The same green note that smells like crushed leaves and sticky buds (galbanum) gives the extrait de parfum more complexity. Chamade feels closer to the original than it has in years. A fragrance that truly deserves its iconic status. Look out for the batch number that starts with 3 (indicating that it was produced in 2013). The big dose of vanilla and coumarin without a strong animalic note renders the drydown of L’Heure Bleue somewhat unbalanced. For extrait de parfum, it seemed rather soft spoken. Also missing is the lush, heavy powderiness as well as the striking brightness and anisic sparkle. Overall, though it is still a very lovely, plush blend, it lost some of its character. Interestingly enough, minus the heavier animalic notes, it evokes the cleaner American take on the floral oriental genre of which L’Heure Bleue is a forerunner (Oscar, Gloria Vanderbilt.) The sillage is good, but the fragrance is not as radiant as it used to be. Ah, the beautiful Mitsouko, over the reformulation of which so much ink was spilled. Initially, it is quite lovely with its peachy, spicy-anisic top, but the main differences are obvious in the drydown, where the absence of dark oakmoss renders the base thin. 24 hours later on a blotter, Mitsouko is just a crisp, sheer Veramoss (oakmoss synthetic) and musk. On skin, the cinnamon and vanilla come through readily, which gives Mitsouko a surprisingly cheery, even jejune demeanor (in the original, these notes are more blended, so while obvious, they do not stand out as much.) If I would have worn Mitsouko extensively, I would have been disappointed. I have tried the EDP on the blotter, which I preferred to the parfum, but I need to return and compare it thoroughly. 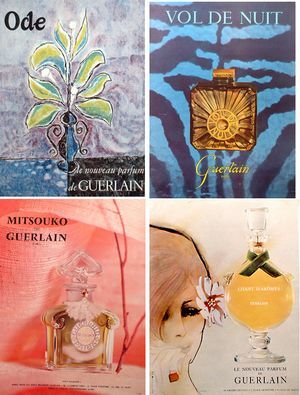 Added 11/23/13: Proving that reformulation is not an irreversible phenomenon that only leads to disasters, Guerlain’s new version of Mitsouko is a big improvement on its other reformulations. The creamy peaches, spicy cinnamon, and cool moss are all there, and the perfume once again feels harmonious. The dark classical oakmoss that smells like ink stained woods and walnut shells is not present (thanks to the new stringent regulations), but the dusky impression is mimicked by different woods, patchouli and new mossy aroma-materials. It’s an obvious improvement on the version that was available previously, and when I compare them side by side, I see that the new Mitsouko is rounded, warmer and more plush. The Eau de Toilette has a bright citrusy accent, the Eau de Parfum is all about golden peaches, and the extrait de parfum emphasizes the dark jasmine. All three are baroque and rich. I’ve checked the batch number on my bottle, and it is 3W01. I was told at the boutique that 3 stands by 2013, so if you’re interested in finding the new reformulation, please use this as the guide. It is a shadow of itself, from the rather flat citrusy start to the pale musky-mossy drydown. If the original is tinted in dark greens, rich browns and ochre, the new one is grayish-brown. In the late drydown, the sweet cinnamon note provides most of the tonality. Will update later with the review of EDT, which is somewhat differently balanced than the parfum. Added 1/22/11: The interesting thing about Vol de Nuit Eau de Toilette is that while thin, it gives me a better sense of the original Vol de Nuit structure than the parfum. All of the elements are in place, and while they are lighter, the beauty of Vol de Nuit is evident. In any case, I have a hard time liking the new Vol de Nuit, because it is so far away from what it used to be. Given the new restrictions on the material, I can only imagine what an impossible task this reformulation might be. The main disappointment for me was Jicky. The character of Jicky is driven by the effervescent, aromatic note—lavender, bergamot, thyme, rosemary—set against musk, civet and vanilla. The animalic-musky accord of Jicky used to be built around the nitromusks and natural civet, which were subsequently replaced. Now, the drydown is even cleaner. The sillage is minimal and the tenacity is quite poor. Compared to all other Guerlain fragrances, the blotter dipped in new Jicky hardly bore any traces on it 48h later, whereas others were still quite recognizable. The vanilla and white musk give it a strange resemblance to fabric softener sheets after they have been through the drying cycle. Added 1/22/11: Jicky Eau de Toilette follows the same progression as that parfum–aromatic-herbal top, dominated by lavender and thyme, thin floral accord and then a pale base of vanilla, sandalwood and musk. In the parfum, the screechy woody note is jarring, while the flatness of vanillin does not help matters either. I prefer the EDT, if I have to chose, but to be honest, I doubt I can bring myself to wear either. Added on 1/22/11: Nahéma went through several reformulations, but the latest ones is the one I like the most. The lush floral accord of rose, ylang ylang and jasmine has the same complexity and dramatic aura as that of my mid 1980s parfum. There is a stronger green note in Nahéma now, and the fruity-rose richness of damascones has been attenuated. However, overall, it is a splendid fragrance with a great sillage and tenacity. Zazie: As my interest in all things Guerlain is only relatively recent, I am just aware (and sadly VERY VERY aware) of the very last reformulations, so this biases my impressions. The two shocking 2010 liftings I am mostly aware of: Shalimar and Jicky. The very new Shalimar extrait, I haven’t smelled, but all things leathery and balsamic and dirty-musky have disapperead from the new EDP and EDT, which have both become pleasant and dull renditions of crème anglaise. So now I am buying old (well, pre-2010 it’s enough) Shalimar stocks from shops, I got a wonderfully leathery, leathery, leathery parfum on right now that I found roughly a moth ago, and am going to look for an oldish version of Jicky parfum. As I don’t squat ebay, I am just driving SAs crazy, but luckily, if I go into the right shops, they are all aware of reformultaions and eager to help: we check boxes and packagings, and we especially look for limited editions which are easier to date. With Guerlain and Shalimar it is quite easy to stunble on LEs. Yesterday I punt my hands on an oldish n°5 parfum, and it feld like undigging a treasure. Olfactoria: Thank you for that thorough comparison, I was hoping for a post like that. Thankfully not all seems lost, a few classic Guerlains are still great perfumes, even if not the same as the original. Ines: I am so sorry to never have tried Shalimar before it was reformulated. I love it now, but that just makes me wonder what it used to smell and how much I would have loved it then. Jicky was an utter disappointment. I had to request a new tester at the counter, because I thought that something was wrong with the first one. First of all, I could not even smell the vibrant aromatic note, which is a hallmark of Jicky. Surely, if Chanel can use plenty of aromatic herbs in Bleu de Chanel, what is wrong with their use in Jicky. Granted, I need to return and resmell other concentrations. The herbal facet in the parfum was always a bit more dimmed, but not as much as what I found in the current version. Victoria: C, I compared it to the 1970s Jicky parfum, which is so much more vivid in all facets, esp. the base. A friend wears Jicky, and I kind of followed its progression over the years. It seems to become more and more pastel colored. Flora: Oh dear, this is not good news – they messed with Jicky that much?! Having recently gotten some samples of gorgeous old Mitsouko in a swap, I can’t even imagine smelling the new stuff, it’s just too depressing. Cornelia Blimber: This article is immensely helpful and interesting! I smiled at the picture of Guerlains Ode: I smelled that a long time ago: Guerlains variation on Joy. I get along with you, the former EDT versions were meh. And the extrait is still botched by a smell of cardboard (amber unbalanced). The “Thierry Wasser improves sourcing” story was not just PR lipservice, there are jonquil and narcissus to smell in the actual EDT. I’m almost sure. It’s not the quintessential extrait, but the top note of the EDT plays a perfect tune. It’s now easier to enjoy and to wear (spray a lot). Over with the wishy-washy iris wattery rendition that was only an intellectual pleasure.